The term "Minor Prophets" refers to the reported authors of the twelve short prophetic texts included within the Hebrew Bible (Tanakh) as well as the Christian Old Testament. While the title places those books in contrast to the major prophets (Isaiah, Jeremiah, Ezekiel, and (in some Christian Bibles) Daniel), it should not be seen as a denigration of the former texts, as the term simply refers to the book's respective lengths. The Minor Prophets, whose exhortations were recorded on a single scroll in the classical Hebrew (and only separated when the text came to be translated), run the gamut of Israelite/Jewish history—from the Assyrian period to the Persian. In doing so, they address strikingly varied audiences, from broken-hearted exiles to hopeful builders of a new temple. In spite of this, they consistently stressed a single, primary thesis: that they were God's chosen people, that it behooved them to behave accordingly, and that, in the end, history would vindicate the faithful. In this way (and in spite of their varied historical perspectives), all of the twelve, in their hopeful proclamations and baneful exhortations, were conditioned by this singular perspective. As Bandstra notes, "the books taken as a whole address the big issues of prophecy; namely, Israel's devotion to Yahweh, the responsibility of foreign nations to respect God's people, and the expectation that God will act in the future to vindicate his people and punish wickedness" (378). The collection of twelve texts known as the Minor Prophets was thought to have assumed its unitary form sometime in the first century B.C.E., although first extant mention of the text together is found in the Wisdom of Jesus ben Sirach (second century B.C.E.). The ordering of the twelve books was thought to be an early attempt at a chronological organization of the works (one with which modern textual scholarship tends to dispute). Modern scholars tend to order the books as follows: Amos, Hosea, Micah, Zephaniah, Nahum, Habakkuk, Obadiah, Haggai, Zecheriah, Malachi, Joel, Jonah. Hosea (c. 750-725 B.C.E.) – a prophet from the Assyrian period, Hosea's text is most notable for its metaphorical description of God as the suffering husband of Israel, whose citizens are collectively portrayed as His dallying wife. Joel (c. 400-350 B.C.E.) – this later text (written during the Second Temple period) places prophecy into a historical continuum by uniting past transgressions with eschatological consequences. Amos (c. 760-750) – likely the first of the Biblical prophets, Amos, in his bitter denunciation of the moral failings of both Israel and its rivals, established the pattern that all Israelite/Jewish prophets came to follow. Obadiah (c. 587 B.C.E.) – the shortest book in the Hebrew Bible, the Book of Obadiah simply consists of a prophetic castigation of the Edomites, who were warned that they would face God's wrath for their mistreatment of the Judeans following the destruction of the temple. Jonah (c. 400 B.C.E.) – this book describes the gustation and subsequent disgorgement of its titular character. Given that the book contains no complete prophecies, it has puzzled readers from the time of its composition to the present, as it has perplexed scholars regarding its grouping among the prophetic books. Micah (c. 730 B.C.E.) – the Book of Micah is notable for its far-ranging critique of religious hypocrisy (especially among the economic elites in Judean society). Nahum (c. 620 B.C.E.) – the Book of Nahum depicts the prophet's schadenfreude at the collapse of the detested Assyrian empire. 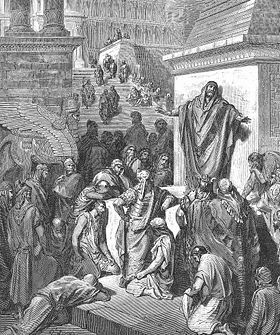 Habakkuk (c. 608-598) – the Book of Habakkuk, which was written "under the shadow of the rising Babylonian power," argues that the Kingdom of Judah will fall if its residents do not return to the law of Moses. Zephaniah (c. 640-622 B.C.E.) – the Book of Zephaniah consists of three major components: "oracles of divine judgment against Judah and Jerusalem," "oracles of divine judgment against the nations," and "oracles of divine promise to the nations and to Judah and Jerusalem." Haggai (c. 520 B.C.E.) – the Book of Haggai represents a singularly focused document, whose sole purpose was to convince its auditors that the continued existence of the Jewish people (and the Jewish faith) depended upon the reconstruction of the temple. Zechariah (c. 520-518 B.C.E.) – the Book of Zechariah is almost unilateraly seen as consisting of two separate documents that were combined into a single source by a skilled redactor. The first of these "books" is concerned with the necessity of the homeland (Zion) and the Temple for meaningful Jewish nationhood. The second "book" abjures the Jewish people to resolutely worship YHWH in order to allow their covenental relationship to be fulfilled. Malachi (c. 500-450 B.C.E.) – the Book of Malachi, which was obviously written after the reconstruction of the Temple, bemoans the lackluster manner in which the temple cult was being conducted, stating that "the worst animals... are being sacrificed," that "priests themselves attach no importance to ritual purity," and that "tithes are not being paid." The Septuagint (Greek translation of the Tanakh) has a slightly different order, beginning with Hosea, Amos, Micah, Joel, Obadiah, Jonah, with the remainder as above. Their ordering scheme also places the books of the "Minor Prophets" before (instead of after) the "Major prophets." Building on the currently developing interest in studying the final form of biblical compositions, much recent work on the Minor Prophets has focused on the redactional history of the collection as a whole, especially on editorial strategies used in the final ‘editing’ of the collection (Nogalski 1993; Jones 1995; Schart 1998). There is no consensus concerning how far back this compositional and redactional history may be traced (Ben Zvi 1996), or even if the attempt is legitimate. Some scholars (e.g. Jones 1995) have attempted to integrate information about the textual history, based on the manuscript evidence, with the redactional history of the collection. ↑ See Bandstra, 349-380; Koch, Volumes 1-2. ↑ New Interpreter's Bible, 197; Koch (Vol. 1), 78-80. ↑ New Interpreter's Bible, 301-303. ↑ Marks, 222-223; New Interpreter's Bible, 339. ↑ New Interpreter's Bible, 435-436. Bandstra, 376. ↑ Koch (Volume II), 180-181; Bandstra, 375. The New Interpreter's Bible provides an excellent overview of the various literary genres that have been proposed for the text and the relative merits (and demerits) of assigning it to each (466-474). ↑ Bandstra, 363; The New Interpreter's Bible 537-538. ↑ As the New Interpreter's Bible notes, "what could be more natural than to cast the defeat of long-hated oppressor as the long-sought after deliverance finally granted by 'a jealous and avenging God'?" (595). ↑ Koch (Vol. 1), 80-81. ↑ New Interpreter's Bible, 623-625. ↑ New Interpreter's Bible, 662. See also: Bandstra, 364-365. ↑ New Interpreter's Bible, 710-712. Bandstra, 370-371. ↑ New Interpreter's Bible, 735-742. ↑ Koch (Volume 2), 175. See also: New Interpreter's Bible, 843-850. ↑ James D. Nogalski and Marvin A. Sweeney (eds. ), Reading and Hearing the Book of the Twelve (Atlanta: Society of Biblical Literature, 2000). ↑ Fuller, 81-82. The sources referred to in this quotation are as follows: J. Nogalski, "Literary Precursors of the Book of the Twelve" and "Redactional Processes of the Book of the Twelve," BZAW 217-218 (Berlin: W. de Gruyter, 1993); B.A. Jones, The Formation of the Book of the Twelve: A Study in Text and Canon, (Atlanta: Scholars Press, 1995); A. Schart, "Die Entstehung des Zwölfprophetenbuchs: Neubearbeitung von Amos im Rahmen schriftenübergreifender Redaktionsprozesse" BZAW 260, (Berlin: W. de Gruyter, 1998); E. Ben Zvi, "Twelve Prophetic Books or 'The Twelve': A Few Preliminary Considerations," in Watts and House (eds.) Forming Prophetic Literature, (Sheffield: Sheffield Academic Press, 1996), 125-56. Buttrick, George Arthur (ed.) et al. The Interpreter's Bible: the Holy Scriptures in the King James and Revised standard versions with general articles and introduction, exegesis, exposition for each book of the Bible. New York: Abingdon-Cokesbury Press, 1951-57. Fuller, Russell. "The Text of the Twelve Minor Prophets." Currents in Research 7 (1999), 81-95. Prophetic Midrash Stories about prophets from ancient and modern sources. This page was last modified on 9 October 2018, at 16:17.